Become the lady or lord of leisure in your backyard beneath this beautiful lattice pavilion! 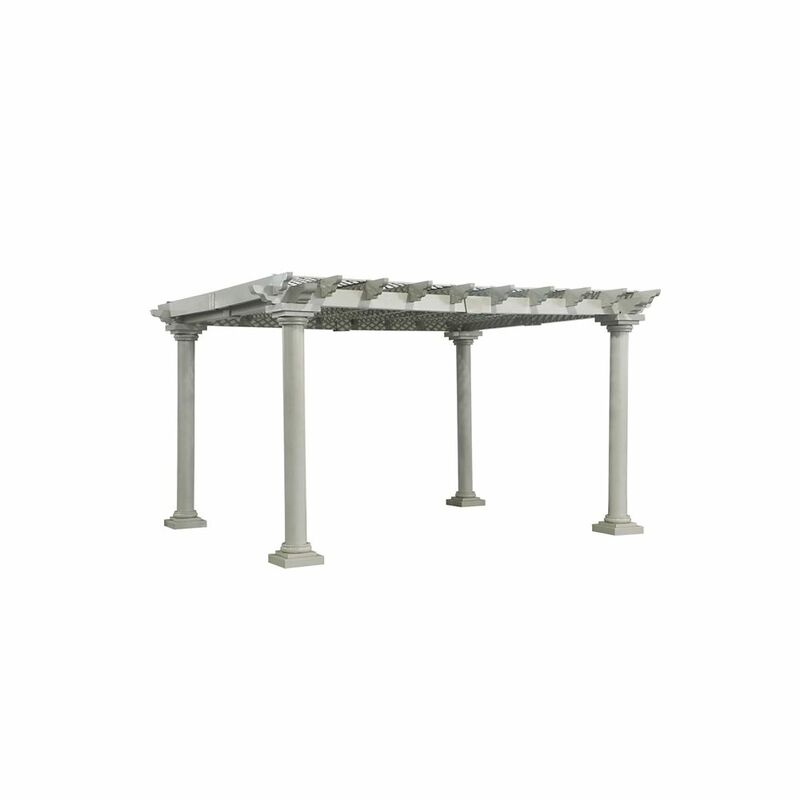 Four stately columns support a steel lattice top, invoking images of royal and aristocratic afternoons of luxury. Enjoy the semi-shaded area however you see fit and add a regal sense of style to your backyard with the addition of this stunning pavilion! Lockhart Pavilion Become the lady or lord of leisure in your backyard beneath this beautiful lattice pavilion! Four stately columns support a steel lattice top, invoking images of royal and aristocratic afternoons of luxury. Enjoy the semi-shaded area however you see fit and add a regal sense of style to your backyard with the addition of this stunning pavilion! Lockhart Pavilion is rated 1.0 out of 5 by 1. Rated 1 out of 5 by Windsorcustomer from 14 ft. x 12 ft. Off white steel Aluminum Pergola Parts were bent when arrived. Contacted "Sunjoy" not Home Depot for replacements. As per the instructions inside the box. That began a series of unmet promises and lots of excuses and no parts to replace the damaged ones. Finally had to purchase another entire Pergola in order to swap out the parts we needed to continue to put ours together. This took months. We then had to load up 2 huge boxes weighing over 400 lbs. and return them to our local Home Depot in order to get a refund on the 1st one. Apparently there were no spare replacement parts in the entire U.S. but plenty new complete sets. Started this process in July 2015 and it took until November 2015 to get the Pergola parts needed. Now it is so cold and rainy that we are waiting until spring to finish up this project. Entire experience was not good at all.